Earlier this week, I completed the poly fiber trees in the area around the west end of Nelsonville. 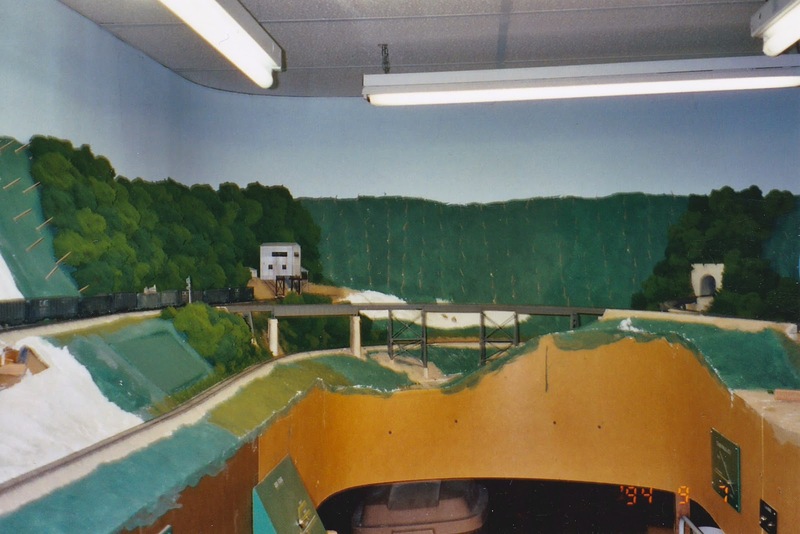 The last section to be finished was the area between the prep plant at Summit Springs and BA Cabin which controls the west end of Nelsonville Yard. The entire side of the peninsula along Nelsonville and Summit Springs is now covered as can be seen in the shot below. A lot of scenery remains to be finished around BA Cabin. But at this point, there are only two areas that remain to be covered with trees. The first is the lift-out behind the engine service area at Hollister Yard. 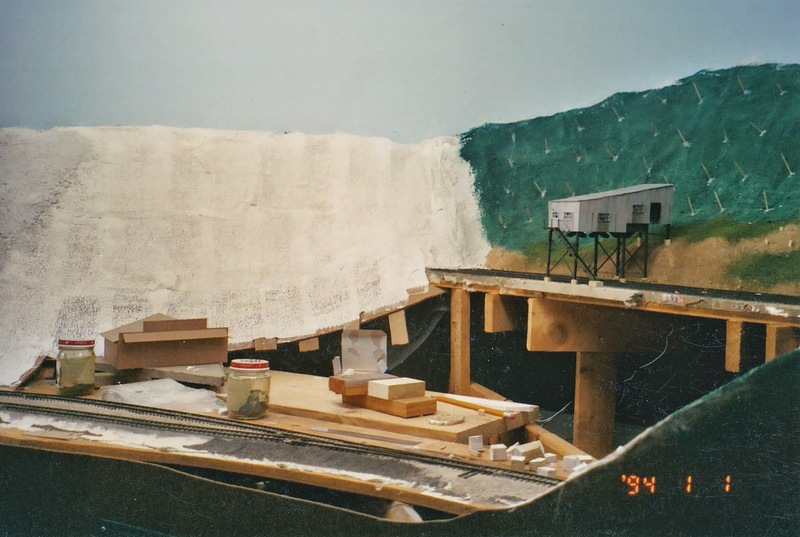 I need to be able to get in there to lay the tracks for the roundhouse and to finish the scenery in this area once the roundhouse is built. I'll then come back and, using a creeper, finish up the trees. The other area to be completed is the east end of Nelsonville along the Wilson Bridge Branch. I've already started gluing toothpicks in place in this area as can be seen in the photo below. There will also be a small tipple along the hillside behind the wood chip cars. 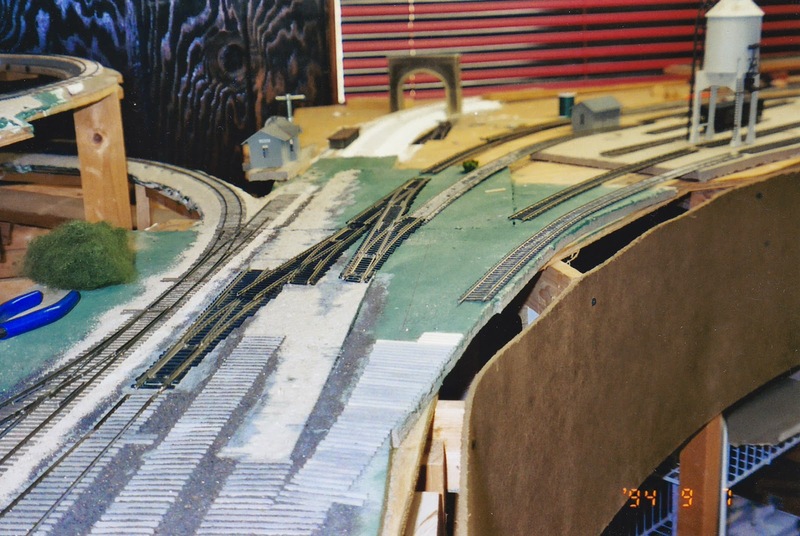 This will be the last tipple to be added to the layout- at least in its current configuration. 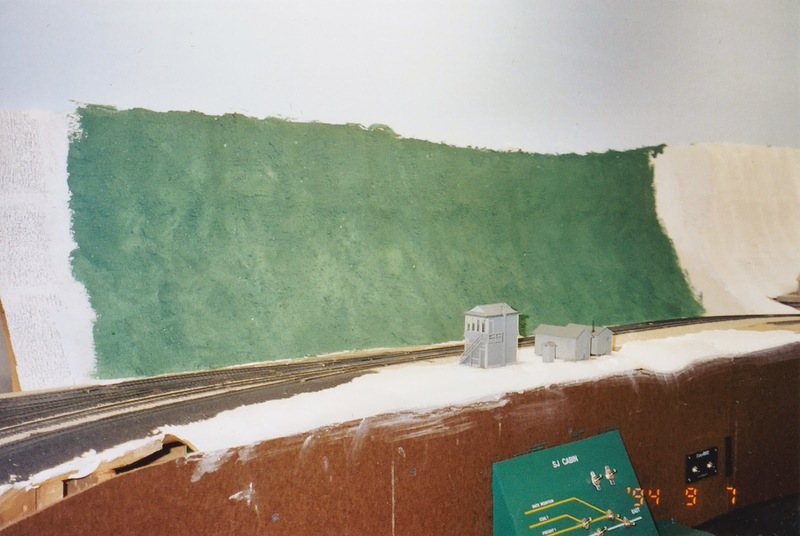 The photo below show the layout after the very first section of poly fiber trees was completed. These trees were left over from my previous layout and were eventually replaced. There were times I thought that I would never get the entire layout covered with trees. And while it's not done yet, the end is finally in sight. 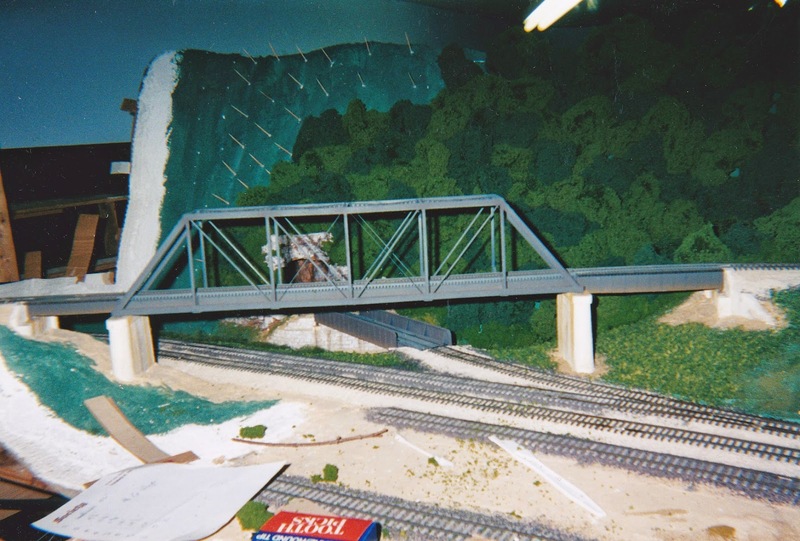 While looking through the box of photos that I keep in my workshop last night, I came across a group of photos that were taken at various times during construction of the layout. I thought it would be neat to go back and photograph some of these locations now and do a little "Then and Now" piece. So here goes. This first shot shows the view across the west end of North Pierce. I believe all of these photos were taken at roughly the same time and it was probably in the 2004- 2006 time frame. And here's the view today. It's always amazed me what a difference a little paint on the fascia can make to the overall appearance of the layout. Next on the tour is SJ Cabin at the east end of Hollister Yard. Moving further east, we come to Logan, WV. Some of the biggest changes have come in the area just east of Big Chimney, WV. The Central Valley bridge over the main line at Big Chimney was extensively modified after the picture below was taken. Moving on toward Nelsonville, we see a several shots of the Laurel Ridge Prep Plant at Summit Springs. These are some of the more dramatic "before and after" shots. Next up are some shots in and around the east end of Nelsonville. 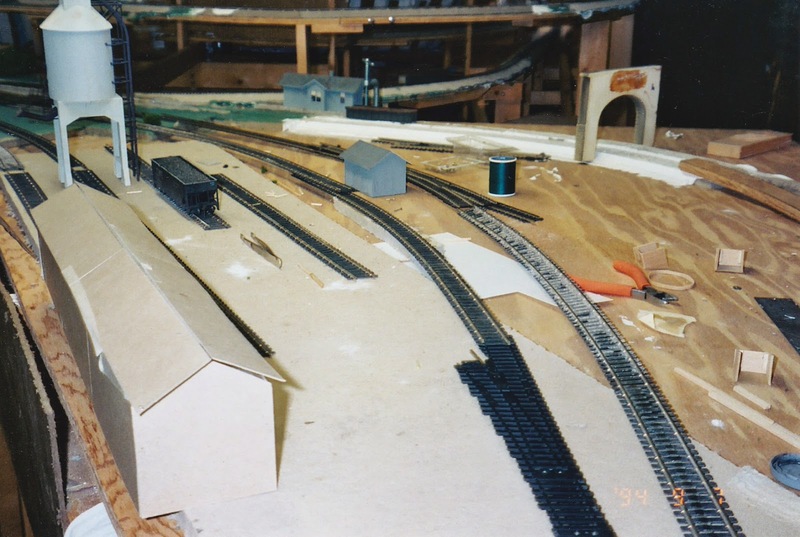 This first shot shows the original layout of the track in this area along with some commercial turnouts set in place to see how the proposed track arrangement would work. Originally, the main line and the yard lead were going to enter the double track portal in the background. 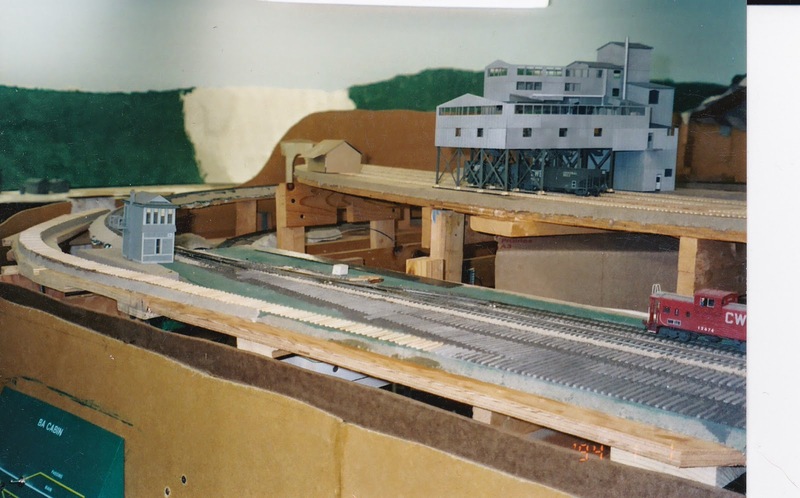 At this point in time, I had just developed the track layout for the engine terminal and the Wilson Bridge Branch. 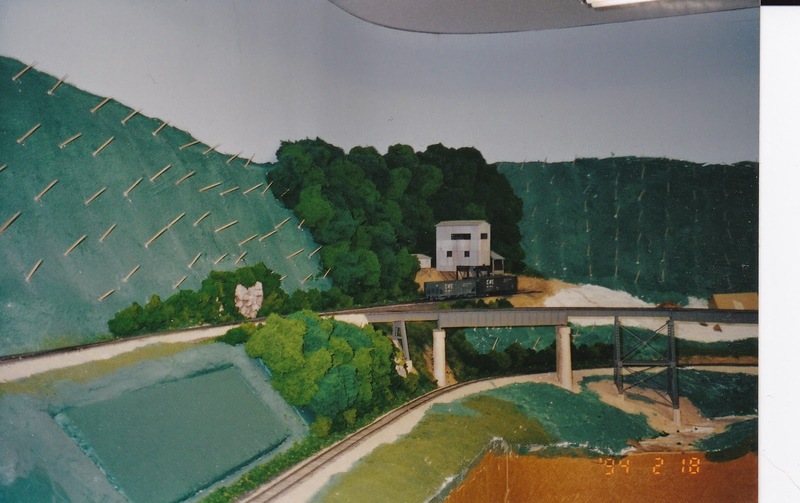 I was never happy with the yard lead heading into the tunnel, so the layout of the engine terminal and branch gave me the opportunity to change the ladder here. Here's how this area looks today. 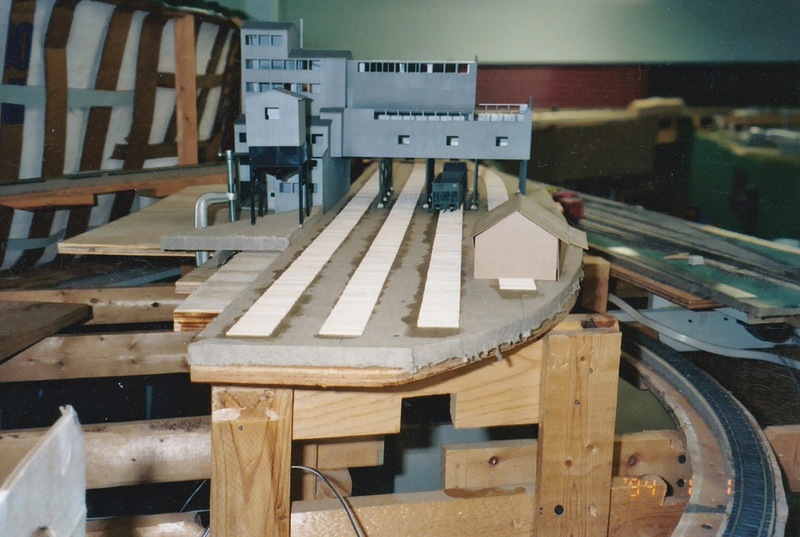 The next shot shows the development of the engine terminal, caboose track and branch. As the time frame for my layout is the summer of 1976, I have always planned to have a bicentennial diesel on the roster. However, the project never developed much beyond that initial thought. Once I started operating on a regular basis, several of the crew members brought up the topic of a bicentennial unit. This started discussions about the diesels that were painted way back in the mid-1970's and the many varied paint schemes that were developed to commemorate the Nation's bicentennial. Then in mid-November, Matt Snell asked if I had ever thought of doing a bicentennial unit. Turns out that he was looking for material for some articles and wanted to do something a little different. He proposed to do a CWE bicentennial unit for the railroad as the basis for an article and it took me just under a nano second to say "yes!" While I'm sure many of you are already aware, Matt Snell is one of the most prolific writers in the model railroad press today. There is seldom a month that goes by in which one of his articles doesn't appear in one of the industry publications. 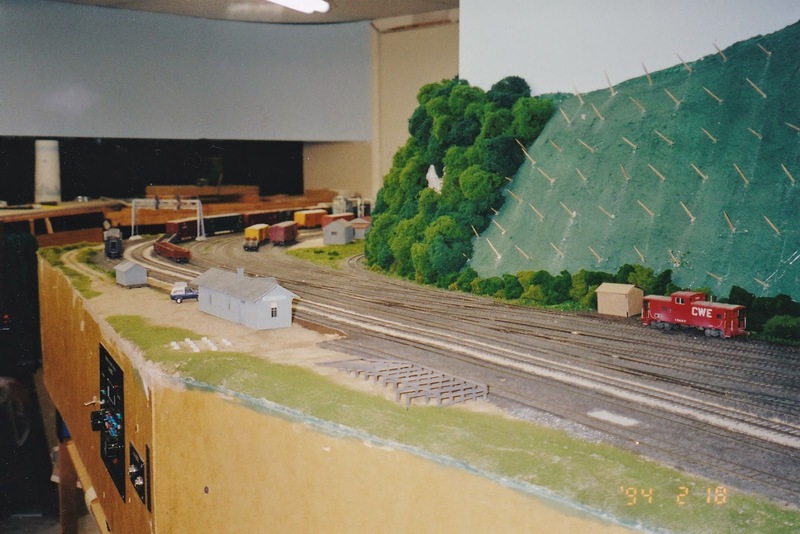 And Matt and his wife Debie have created one of the most realistic and prototypically operated layouts in the country. 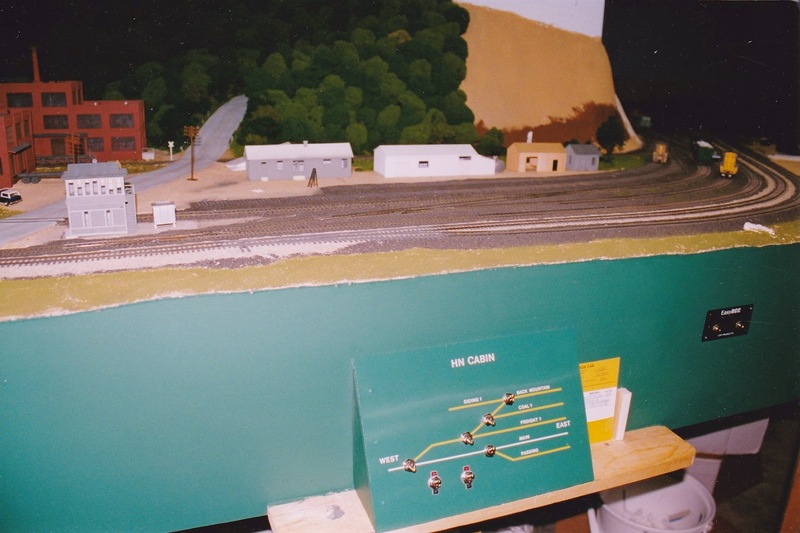 Their Conrail Shared Assets Operation layout was featured in the 2006 issue of Great Model Railroads. Matt proposed to use an Atlas GP38 that he had on hand as the locomotive for this project. As I already have two of these in operation on the layout, it seemed like the perfect candidate. Through the month of December, Matt designed the paint scheme, acquired the decals and painted the locomotive. I was speechless when I first saw it. Anyone who remembers the bicentennial paint schemes will instantly realize that Matt absolutely nailed the look of the locos of that time. Matt really outdid himself on this one. So with that background, let's take a look at the unit in operation. In the photo below, 2000 has just emerged from Bell Knob Tunnel and is headed east toward Petersburg Junction. Next, we catch 2000 approaching the west end of Big Chimney. Number 2000 is on the point of EC-2 today, the Bay Flyer. 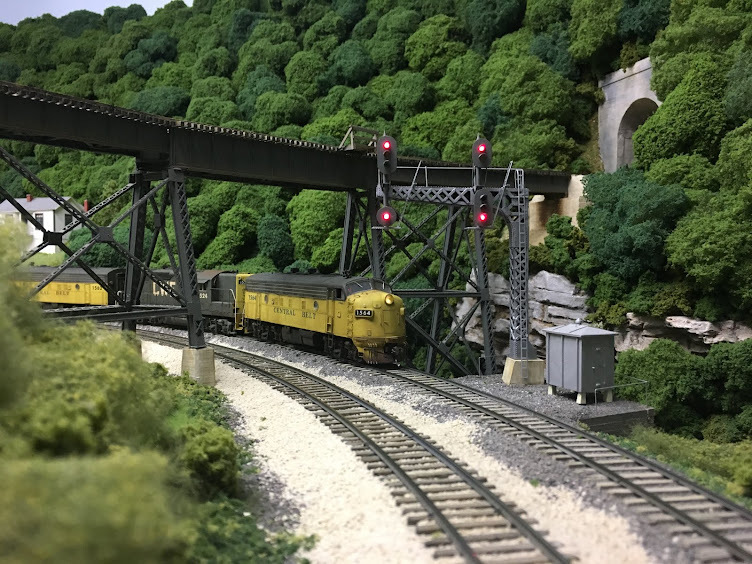 It's one of the hottest trains on the railroad and operates between Erie, PA and Hunters Bay, VA delivering primarily auto parts, grain, and other priority freight. In the picture below, the train is rolling through Big Chimney, WV at track speed. And below, we catch 2000 in a going away photo as it approaches the east end of Big Chimney and the entrance to Camp 3 Tunnel. EC-2 is now marching up the 2.5% grade to Summit Springs and is approaching Cedar Falls Junction where the Sand Creek Branch connects to the main line. After cresting the Appalachians at Summit Springs, we catch the train drifting downgrade into Nelsonville, VA.
And lastly, a little bit of video of the train dropping down into Nelsonville. My apologies for the unfinished scenery and video focus issue. The pictures really don't do the engine justice- you really have to see it in person and in operation to appreciate the fantastic job that Matt did. Thanks again, Matt, for a very special gift.